Street Studio is a project by photographer Jonathan Turner that celebrates the area of Chapeltown through portraits of its local residents. The photographs were exhibited at Union 105 and Inkwell Arts in 2015. Leeds Inspired supported the project with a £7,523 grant. 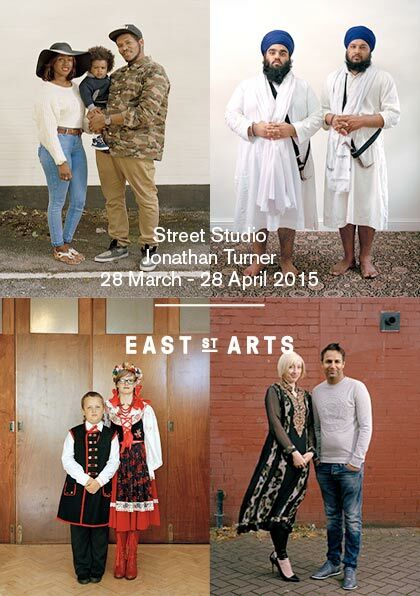 Jonathan Turner is a lens-based artist and lives in Chapeltown. His work is primarily portrait-based and considers issues around identity. He has a long history of working with communities, teaching photographic skills and facilitating participatory photography projects. During 2014 Jonathan photographed individuals, families and community groups in the Chapeltown area. The project revived an old tradition of the ‘Smudger’ who (in the days before mass camera ownership) provided a cheap while-you-wait photography service up and down the streets and seaside resorts of Britain from the late 19th to mid 20th century. For this new project street studios were set up in various locations in Chapeltown, Jonathan produced free portraits for all participants in the photographs. He also collaborated with Inkwell, Mandela Centre and Leeds Young Authors by hosting free photography workshops for young people and community groups. A selection of images from Street Studio went on to be exhibited as part of True North at White Cloth Gallery. Street Sudio also won the John E Write Award at the international contemporary photography festival Format.